Taiwan plane rescue effort ongoing Jump to media player At least eight people have died after a TransAsia Airways plane clipped a bridge and crashed into a river near the Taiwanese capital, Taipei. 'I saw Taiwan plane drop down' Jump to media player An eyewitness in an office building says he thinks the pilot of a TransAsia Airways plane that crashed in Taipei was trying to avoid buildings as the plane went down. 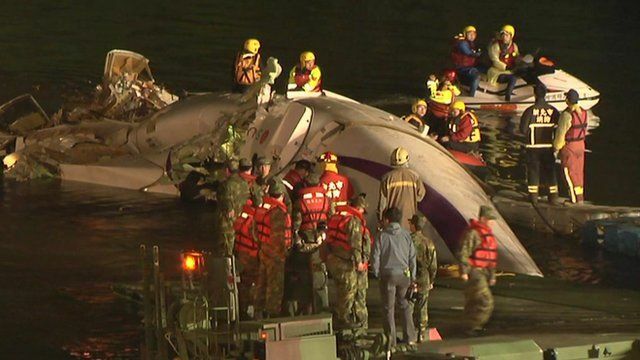 Footage shows Taiwan plane crash Jump to media player Footage of the TransAsia Airways crash in Taipei appears to show the plane hitting the bridge moments before plunging into a river. A plane carrying mostly Chinese tourists has crashed into a river in Taiwan, killing at least 23 people. Dramatic video footage emerged showing the TransAsia Airways plane clipping a bridge as it came down shortly after take-off from a Taipei airport. The BBC's Cindy Sui says that authorities at the scene are planning to build a new bridge in an attempt to get the plane out from the water.